Drop-In Anchors are made from standard zinc, stainless steel 316 and stainless steel 304 to meet any construction needs. Materials are passivated and tested to ASTM and other International Standards. Drop-In anchors are machine threaded anchors for widely used in solid concrete, hard stone and brick. Drop-In Anchors are also available with lipped collar to prevent the anchor being pushed. Drop-In anchors are available with any type of coating including chrome, nickle, zinc, brass, tin or any as per custom requirement. They are available in any metric or imperial sizes as per Custom Specification. Drop-In Anchors are internally Threaded Anchors. Drop-In Anchors consist of a tubular expansion shield which is pre-assembled with an internal, cone shaped expansion plug. General range of drop-in anchors feature a smooth, flangeless head which allows for flush embedment. Accepts bolts or threaded rod with national coarse threads. Hole diameter is equal to anchor’s outside diameter. 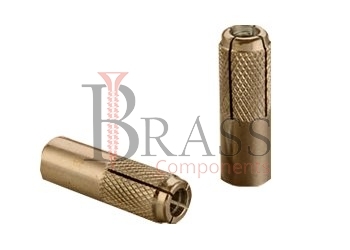 Allow for shallow embedment to standard knurled anchors. Available in different configuration of sizes, diameter, material type, internal thread length, minimum edge distance and required hole size. Available with minimum anchor spacing and minimum edge distances. Minimum depth of embedment is the anchor length. Drop-In anchors provide consistent holding power at shallow embedment. Tested to ASTM E488 criteria and listed by ICC-ES. Drop-In Anchors often used to support handrails, lightening fixtures, piping and more. Intended for used in concrete. Best Suitable for light to heavy duty fastening purposes. Great Fastener when working with flush mounting applications. Designed for outside wet applications. We manufacture Drop In Anchors as per Custom Specification and export in Germany, Sweden, Denmark, Norway, Russia, France and other European Countries. For more Information, Please Contact Us or Inquiry Now.